If ever there was a fairytale involving a musician, it must be that of flute maestro Hariprasad Chaurasia, who turned eighty last month. Here was a near genetic oddity—in that he was born to a wrestler father (and unschooled homemaker with no artistic pretensions) who had ambitions for his sons, dreaming they would follow in his footsteps and achieve glory in the akhada. Remarkably, the youngest son Hariprasad, born on 1 July 1938, discovered the joy of music even as a child, and yearned to become an ustad—a musical, not fighting one. He in fact developed a distaste for wrestling early. Little Hari showed a talent for singing in a sweet voice, joining the chorus of devotional singing in a nearby temple, encouraged by the family’s neighbours and the temple priests. His introduction to the bamboo flute was accidental, almost serendipitous. He one day followed a street child who was playing a plaintive tune on his humble bansuri, and actually stole it from him! Quite the little Krishna! Hari’s first music teacher was a Pandit Raja Ram, a reputed dhrupadiya from the neighbourhood. Raja Ram took the nine-year old under his wing when he realised how keen the little fellow was on music. Hari also benefited from his association with the family of an Ayurvedic doctor and neighbour Kailashnath Chaturvedi, regularly joining in the impromptu practice sessions in which father and two sons sang and played the harmonium and tabla. Mrinalini Sarabhai was born on 11 May 1918 in Chennai and passed away in Ahmedabad, just two years before her birth centenary in 2018. She was well versed in Bharatanatyam, Kathakali and Mohini Attam and was educated at Shantiniketan under the guidance of Rabindranath Tagore. She was a trailblazer in many ways—when she married space scientist Vikram Sarabhai and moved to Ahmedabad, she took the classical dance forms of the south to western India. She was the founder-director of Darpana Academy of Performing Arts in Ahmedabad which imparts training in classical dance, theatre, music, folk arts and puppetry. Mrinalini was a social activist and believed that art can be used to inform and transform society. She was among the first to choreograph on social themes in classical dance. Besides being a classical dancer and guru, she was a poet, writer and environmentalist. She received several prestigious awards including the Padma Bhushan, the Sangeet Natak Akademi Fellow and honorary doctorates from renowned institutions. 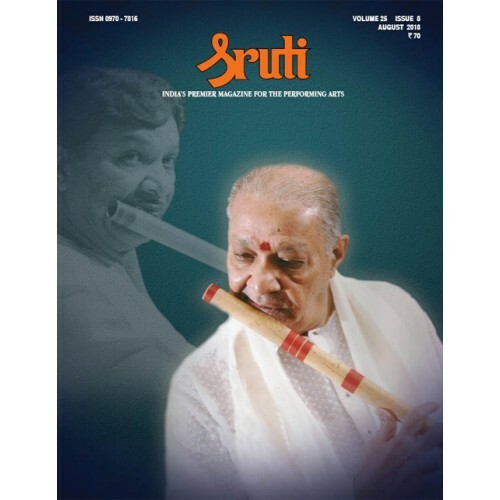 The Sruti Foundation honoured her with the E. Krishna Iyer Award in 2007. Over the years, Sruti has published interviews with the thespian as well as several articles on her life and achievements. On the occasion of her centenary, we interviewed her daughter Mallika who is a leading dancer, actor, activist and head of Darpana Academy. “My mother just left for her eternal dance,” is how Mallika described Mrinalini Sarabhai’s demise on 21 January 2016. Propagating classical dance, reviving folk forms, and using arts to bring about change in society seem to have been Mrinalini Sarabhai’s motto and passion. What was her vision for Darpana when she launched it in 1949? Mrinalini Sarabhai (Amma) did not want to start a school, but with the arts of southern India unknown in this part of the world, my father Vikram Sarabhai felt that to build up an audience you had to educate families. The best way was to start teaching and making people understand the spiritual and ethical nuances of the styles, and to perform and show people their magnificence. That is why Amma started the school. For the first many years the only students were Papa’s school and collegemate women. Then around 1955 Amma got her first two Gujarati students, Rupande Shah and Minaldevi Mahadevia, both friends and daughters of educated and wealthy families. They also became her first two professional performers of Gujarati origin. Soon followed a trickle, and then a flood of students. By the 1960s there were lines of white clad girls on bicycles headed for Darpana Academy, as shown in a mural on the Ahmedabad Municipal Corporation building in a collage. Alaknanda Samarth is counted among India’s pioneering stage actors. Settled in London, she hails from Mumbai where she studied at the Elphinstone College. Her acting career began with Ibrahim Alkazi’s Theatre Unit in Mumbai. In 1959 her performance in Strindberg’s Miss Julie (when she acted alongside director Ebrahim Alkazi) won her the Wien International Scholarship in Theatre Arts at Brandeis University in the U.S.A. On the way back after completing the course, she auditioned for the Royal Academy of Dramatic Arts (RADA) in London and was successful in winning the Queen Elizabeth scholarship to study theatre; she was among the first few Indians to train there. She went on to perform major roles in European classics. She acted in the plays of Jean Anouilh, Bertolt Brecht, Jean Cocteau, Peter Handke, Henrik Ibsen, Garcia Lorca and others. She returned to India after a five-year stint. In 1965 she acted in director Satyadev Dubey’s biggest hit Band Darwaze, his Urdu version of Jean Paul Sartre’s No Exit. Her performance was so impressive that it is talked about even today. The brilliant director described her as “India’s only properly trained actress”. In 1975 she became the first Indian actress to perform in a classical lead role in Phaedra Britannica at the National Theatre, London. She also worked with many avant-garde groups. She was invited by B.V. Karanth to teach acting at the National School of Drama (NSD) Delhi from 1979 to 1982. After several years Alaknanda Samarth returned to the stage in Mumbai where she had initially established a reputation as an exceptional actress.